The Overwater bungalows are situated in the turquoise waters of the lagoon, with an incredible view of the reef, a little island (motu) and the open ocean beyond. Photo copyright InterContinental Hotels & Resorts French Polynesia. Video copyright InterContinental Bora Bora Le Moana Resort. 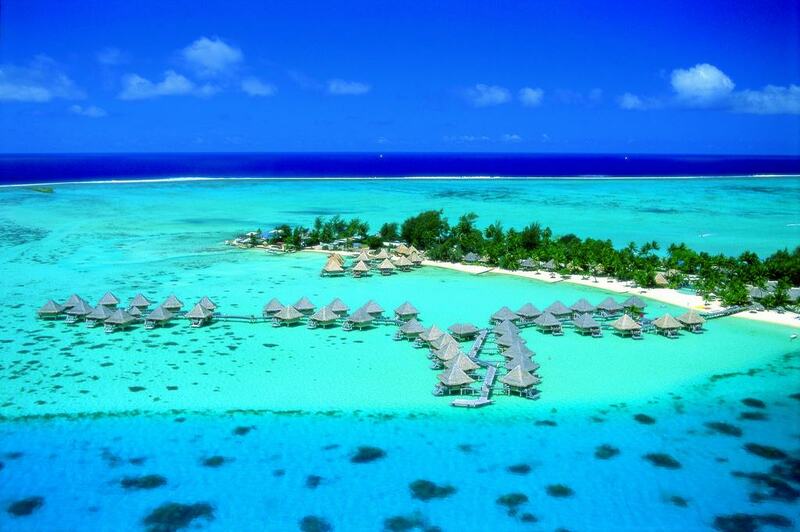 The resort is anchored between two white sand beaches that border the shores of Point Matira, unanimously recognized as the most beautiful site in Tahiti. Accommodation comprises of 14 'fares' at the edge of the beach, 52 overwater 'fares' suspended above the crystalline waters and 2 spacious two-bedroom suites. All are furnished to a very high standard. Le Noa Noa Restaurant opens onto a patio and the lagoon and serves French, Polynesian and International cuisine, while the Vini Vini terrace bar serves refreshments and snacks. When it comes to sports and leisure, the hotel has almost all activities available that come to mind. Pros: Very authentic Polynesian feel. Amazing snorkeling in the field of coral heads between this resort and the Sofitel Motu...all close enough for very easy snorkeling straight from your overwater bungalow. Stunning views of Mount Otemanu.